Brownies In An Orange might not strike you as being geeky at first glance, but there’s tons of food science at work as those brownies cook. And if there’s one thing which defines a geek, it’s curiosity and wondering how things works—which is why knowing even a little bit of food science can help you turn out a better meal! Making this quick—and kid-friendly—dessert is easy. Here’s how. Prepare the oranges. Place an orange on a cutting board, and grab a short, serrated paring knife. Cut off just a little bit of the bottom of the orange, so that it won’t roll around when placed on a baking tray. 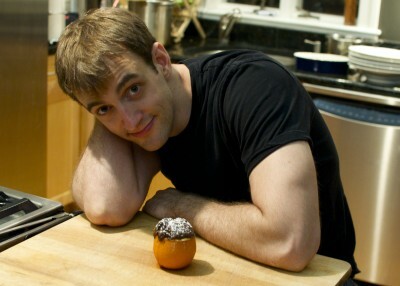 Then, cut off the top of the orange, this time, cutting off enough so that you can see the actual flesh of the orange. Next, cut out the flesh of the orange. I do this by making one long round cut around the inside of the pith—that’s the white bit of the peel—and then making a few diagonal cuts through the center of the orange, popping out wedges of the orange. Don’t cut all the way through to the bottom, though! Trust me, it sounds a lot more complicated than it is; and any way that you can get the orange pulp out will work. (Here’s a quick-‘n-dirty YouTube video I made for Deb over at The Today Show showing this, if you want a visual aid.) Drain any orange juice from the center, and you’ve got your hollowed-out oranges. Leave a bit of pulp on the inside; it’ll flavor the brownie mix! 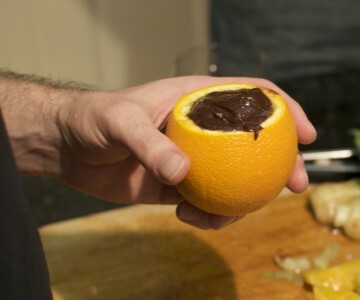 Fill the oranges with your brownie batter. Use your favorite recipe to make a batch of brownie batter from scratch, or just snag a box and follow the mixing directions on the back. This isn’t a sophisticated dessert—it’s just about having fun in the kitchen and getting you to see things in ways you might not have thought of before. Don’t fill the oranges all the way to the top; they’ll overflow! Which isn’t bad, actually: any brownie mix that flows over the sides and bakes onto the outside will just add visual appeal and leftovers for the chef to nibble on when no one is looking. Here’s a photo of me doing it the wrong—but delicious!—way. Bake! Set your oven to 325°F or 350°F—whatever your recipes says—and bake for around 20 to 25 minutes. There’s no exact set time for when they’ll be done; it really depends how gooey versus set-up you like your brownies. You can use a toothpick to check doneness, looking for the toothpick to come out only slightly-coated. 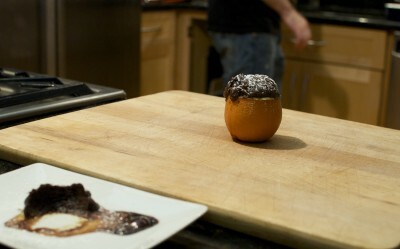 But if you under-bake these, they just come out as delicious chocolate-orange molten lava cakes. Really, there’s no wrong way to cook these. Dust with powdered sugar and serve. So where’s the food science in here? All over the place! Here is just a peek at some of the food science—and geeky thinking—behind Brownies In An Orange. Why set the oven to 325-350°F? Since baking is all about adding heat to the food, you’d think that a few degrees difference wouldn’t matter. But it does! That’s because different chemical reactions occur at different temperatures. Water boils at 212°F. (Well, if you live at altitude, then lower; and if you have stuff like salt or sugar in the water, higher.) But water boiling off around 212°F isn’t the only reaction. Sugar begins to caramelize and visibly turn brown at around 356°F—just above that 350°F temperature! This reaction adds complexity and depth to the flavor of baked goods. You want this to happen for some baked goods—peanut-butter cookies, for example, so we bake those at 375°F—but not other times, such as brownies, where you want the flavors of the chocolate to come through, which is why we bake them slightly cooler. Why doesn’t the orange burn? Because it doesn’t get hot enough! There’s a lot of water present in the rind, as well as the brownie batter. Think about the cooked brownie: it’s not brittle, dry, and tough—that’s because there’s still a lot of water present after being baked. Putting food into an oven set to 325°F doesn’t mean that the food itself is going to get to 325°F when it’s done. This is why we time how long we bake things—it’s all about pulling it out of the oven once the baked good comes up to the appropriate temperature. A loaf of bread in a 400°F oven, for example, is actually done when the outside of bread gets to around 310°F and the internal temperature is somewhere around 200°F. Why do orange and chocolate taste so good together? It has to do with the chemicals that make up the odors responsible for each ingredient. Similarity in compounds seems to be a good predictor of compatibility of ingredients. (See foodpairing.be for cool details.) This is why some combinations that sound odd at first actually work together so well. Watermelon and feta cheese? Fantastic, and a great summer-time salad.